With this blog, I want to share some beautiful writing about the continent of Africa. I then I want to climb up on a virtual soapbox and protest someone who I believe is using Africa for their own profit. 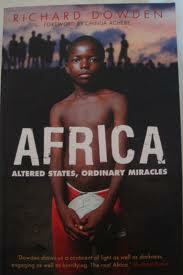 Last week, I picked up a book at Chapters on a whim titled Africa: Altered States and Ordinary Miracles. The first chapter knocked my socks off. In author Richard Dowden’s opening pages, I read in his striking words, exactly what I feel about this beautiful continent. He writes what Ashley and I cried about on Leybato’s peaceful patio overlooking Fajara beach before we came home in August. We cried because we feared that no one else would understand our experience; understand how we’ve come to know that Africa is filled with the most beautiful humanity left on the face of this planet. This author puts understanding into words that are easy to read. I will share the words that captured my breath. “I have watched the sun set, shrunken and mean, over a cold, drab London street and stood outside a mud hut the next morning on Kenyan hillside and seen it rise in glory over the East African plains. Africa is close. “Few go there. Africa has a reputation: poverty, disease and war. But when outsiders do go they are often surprised by Africa’s welcome, entranced rather than frightened. Visitors are welcomed and cared for in Africa. If you go you will find most Africans friendly, gentle and infinitely polite. You will frequently be humbled by African generosity. Africans have in abundance what we call social skills. These are not skills that are formally taught or learned. There is no click-on have-a-nice-day smile in Africa. Africans meet, greet and talk, look you in the eye and empathize, hold hands and embrace, share and accept from others without twitchy self-consciousness. All these things are as natural as music in Africa. I am halfway through this book and what follows is as good as this beginning. It’s possible, I guess, that something might disappoint me in the second half. I don’t think it will. If you want a closer glimpse at the humanity I love so much, if you want to learn more about Africa’s past and present from your own home, if you want to explore Africa’s complexity, do yourself a favor and read this book. I am disappointed in a move the publisher of this book made. Let me remind you what ‘tough love’ means. ‘Tough Love’ is defined by the Merriam-Webster dictionary as the Promotion of a person’s welfare, esp. that of an addict, child, or criminal, by enforcing certain constraints on them, or requiring them to take responsibility for their actions and also as love or affectionate concern expressed in an unsentimental manner (as through discipline)especially to promote responsible behavior. Wow, O Magazine, way to be so xenophonic, condescending, representative of the worst Western stereotypes and completely miss the point of this book. Did you miss the blatant main message of the prologue and each chapter? Africans will develop solutions for Africa. In fact, the author clearly articulates his theory that colonization, imperialism, post-colonial neo-colonization and continued political interference by Western governments are some of the primary reasons for much of the conflict and political instability on the continent of Africa. O Magazine, if you understood this, you would not have read this book as a ‘tough love’ love letter because you would understand this book was about understanding Africa. It was written for those who haven’t had the enormous fortune to experience it themselves. It was not about passing on paternalistic judgment from a (wrong) place of moral superiority. If you understood that, you would understand that a Brit writing a “tough” love love letter is neither required nor appropriate and the last thing that Brit Richard Dowden would do. I am disappointed by this comment and disappointed that the publisher chose to put it on the book cover. Perhaps the publisher felt that this book needed the blessing of the conglomerate that is Oprah. Sadly, Oprah inarguably has a powerful influence on many members of the American public in areas of what to read, what to buy, what to want. I’ve never hidden my opinion of Oprah. If you love Oprah, that’s fine. Millions of people love her. My reasons are pretty simple. She deliberately and widely promotes herself as a great and generous philanthropist. She wants the world to believe that she is a person who cares deeply about education in Africa and that she is saving lives in Africa, one student at a time. I don’t believe that her actions back up her self-created grandiose philanthropic savior image. Given the scope of her publicized philanthropic persona, I don’t believe that she is that generous. Sure she pledged $400 million dollars to build a girl’s school called the Oprah Winfrey Leadership Academy for Girls south of Johannesburg, South Africa. Education is a cornerstone of development in developing nations. Building a school is great. I give her that. Oprah’s school, set over 22 acres, opened in January 2007. It began with an enrollment of 150 pupils with plans to increase to 450. It features state-of-the-art classrooms, computer and science laboratories, a library, theatre and beauty salon. The school had been criticized as elitist and unnecessarily luxurious. I agree. There are a lot of youth in South Africa that don’t have access to education. South Africa is a country of over 50 million people. There are 18 million youth under age 18. According to Unicef’s 2009 data, 30% of high school aged boys and 26% of high school aged girls are not enrolled in secondary school. Poverty and lack of resources keep youth out of school. It’s important to think about want things cost in the world of international development. Well-known Canadian NGO Plan Canada (formerly Foster Plan Canada) has been in the business of building schools since 1937. According to their work, the price of school supplies for one child for one year is $30 a year. A library in a box, enough books for 100+ students costs $120 per year. Teacher training is $500 per year. School fees are about $300 per student per year. The price tag for building a school (in Rwanda)? $40,000. So did the 450-student school that Oprah built require an expenditure of $40 million? Probably not. Could she have built many schools for that price? Sure. Did the school that she built require a beauty salon? In a country where 30% of youth can’t attend school because of poverty? No. I don’t think that the way Oprah lives and conducts her business (the Oprah Winfrey Show) are congruent with being a true philanthropist. Oprah does not spending a considerable amount of her net worth on development in Africa. She is reported to have a net worth of 2.5 billion dollars. That’s more than 2 times 999 million. By 2008, her yearly income had increased to $275 million. And that was 3 years ago. On the season premiere of 2004, all 276 people, in Winfrey’s show audience were given a new car (donated by General Motors). Some 302 “ultimate fans” accompanied Winfrey to Australia (donated by Australian tourism bodies). An estate on the island of Maui, Hawaii. Does a person need six homes? That’s a rhetorical question. Oprah can live her life and spend her money whatever way she chooses. I don’t believe that the small amount of net worth that she spends on Africa gives her the right to brag about being a heroic philanthropist, resulting in publicity for herself, her business and adoration by the masses. I’d love to see her take a page out of the Bill Gates’ life and do some long lasting good with her considerable wealth. Bill and Melinda Gates are the second-most generous philanthropists in America, having given over 48% of their fortune, $28 billion, to charity. Oprah makes the list at number 35, having given over 12% of her fortune to charity. My problem is that she has given herself about 95% more publicity than the 34 people ahead of her on the list. Those 34 people are ordinary heros. You can read more here, here and here from Americans who feel the same way as I do about Oprah (they go a few steps further). So to close this blog, read Africa. Altered States, Ordinary Miracles and ignore Oprah. This entry was posted in International Development and tagged Africa, beauty, Bill Gates, Charity, Oprah, philanthropy, Richard Dowden, tough love. Bookmark the permalink. Amazing book, half way through. Love it. Loved reading this. I spent time in Uganda in 2009 and experienced everything that this author writes in the pages you displayed. I will definitely be reading this book. Thank you for the recommendation. I share your views on the “Oprah” Phenomenon as well and think that the way you explained it, was so well put. Thank you for that! I can’t wait to read the book!!!! Boo Oprah!